How many cyclists died on Ohio’s roads in 2010? Well, that depends on which reports you look at. 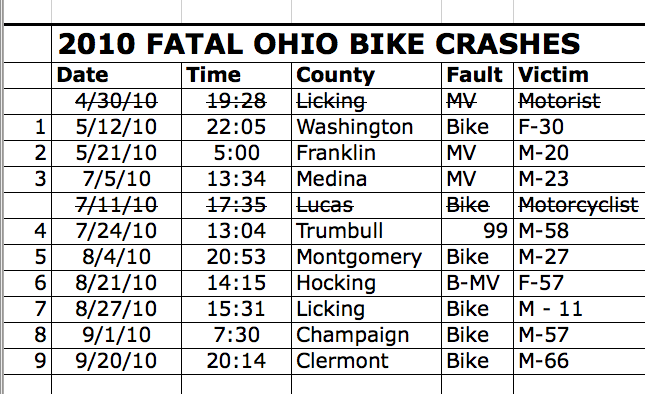 My project to review every cycling death in Ohio is well under way, and I’ve already found a significant error in the numbers generated by the Ohio Department of Public Safety! Their report says cyclists were involved in 11 fatal crashes, but my research says 9 cyclists were killed. Get this… WE’RE BOTH RIGHT… read on to see why! At the end of 2010 I announced a project to review and report on EVERY fatal bicycle crash in Ohio. 1. Obtain report containing a summary of ALL Ohio bicycle crashes from Ohio Department of Public Safety. 2. Review the 200+ page report and locate each case where the “DEATH” column contains a number greater than zero. 3. Obtain the complete official police crash reports for every fatal bicycle crash. 4. Obtain the official police photographs from every fatal bicycle crash. 5. Review the police report, witness statements, photographs, accident reconstruction records and all other data with an eye toward determining if the “official” conclusions as to “fault” and who caused the crash make sense. 6. Determine if any criminal or traffic matters arose out of the crash and, if so, determine what happened. 7. Review medial reports of the crash to determine how bicycle crashes are being portrayed. 8. Write a report outlining the facts of each crash and any findings or conclusions. 10. Shoot for a release date of May 1 [traditional start of “Bike Month”] or for the Ride of Silence. So, I started. Step One was easy. The folks from ODPS, Lindsay Kolmanc from the prior administration and Dustyn Fox from the Kasich administration, have been great. Since I don’t currently have the skill to manipulate the various statistical report generators ODPS offers, Lindsay was kind enough to correspond with me via email and send me PDF files containing reports of EVERY bicycle crash in 2010… and 2009… and 2008, 2007, 2006 and 2005! WOW… Dustyn provided a very quick response on his first day on the job, hooking me up with folks who gave me updated reports for 2010. Each of these reports contains more than 200 pages. The first 180 or so is a county-by-county breakdown of every crash in Ohio in which the “bicycle” or “pedalcycle” box on the crash report was checked. Here’s a summary of the basic crash/fatality data in Ohio from 2006 to 2010. During those 6 years, there were more than 12,000 crashes in which a bicycle was listed as a vehicle, and an average of 15.7 fatal crashes and just over 2,000 crashes per year. If you were in a bike crash, your odds of being injured were high – 80+%, but your risk of death was relatively low – less than 1%. Since we don’t really have any numbers to estimate “usage” we cannot really estimate your risk of actually having a crash on any given day, or ride. We know there are millions of riders in Ohio, who ride tens of millions of miles, so the odds are very very small. According to IIHS statistics some one out of four cyclists killed on the road is legally DRUNK – so if you don’t drink and ride your odds go down dramatically! In 2010, there were 1809 crashes involving bicycles/pedalcycles. There is one line of data for for each crash. That one line contains a WEALTH of information, 24 separate bits of data, as shown below. Given the six years of reports reflecting over 12,000 “bike crashes,” that means there are over 288,000 bits of data in those reports. If one had the ability to catalog that data into a useable tool, one could get a VERY close look at bicycle crashes in Ohio – including a summary of “fault.” However, such a report would PRESUME that the police “got it right” when checking the “fault” box on the police report – a presumption that I, for one, am not comfortable with. Since I did not want to do a 288,000 data point statistical study, the key section I started with was the DEATHS column. For all but 11 of the 1809 total “crashes” involving bicycles in 2010, the “DEATHS” column had a zero. However, those 11 fatal crashes were the ones I was interested in. At the end of the listing for each county there was a year-to-date summary for that county. At the end of the entire report there was a summary of the year. This summary is below. So there were 1809 total crashes in Ohio in which the bicycle/pedalcycle box was checked. Of those, there were 1530 “injuries” and 11 deaths. [The “PDO” listing is for “Property Damage Only.”] I then went through and tracked down the 11 deaths from the 1809 crashes. Those are the ones I am going to write about. 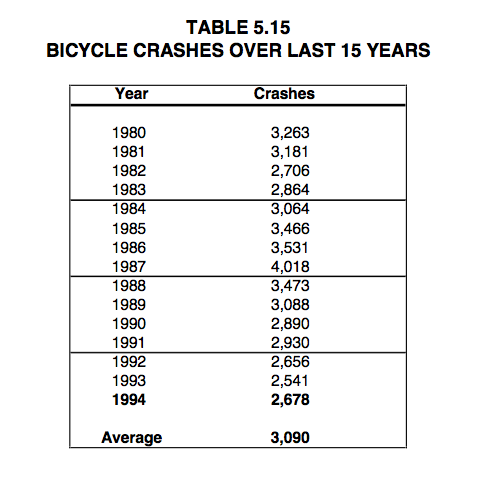 As you can see, Ohio AVERAGED more than 3000 “bicycle” crashes from 1980 – 1994, so 1809 crashes in 2010 is a HUGE improvement. The number of cyclists killed on Ohio’s roads has not fluctuated dramatically. 14 deaths in 1994 – 16 in 1998 – 18 in 2004. Ohio usually has 15-20 cycling deaths annually, so I thought eleven in 2010 was a great number. Then… I started looking each of those 11 crashes. Turns out that TWO of those 11 “fatal crashes” involved the death of a MOTOR VEHICLE operator, not the cyclist! The chart below shows each of the 11 “fatal” crashes involving bicycles in 2010. Two of the crashes – the April 30 crash in Licking County and the July 11 crash in Lucas county are lined out. When I obtained the crash reports from these two crashes I discovered that Yes they were “fatal” crashes and Yes a “bicycle” was involved… but the bicyclist was NOT the person killed! On April 30, 2010, a motorist lost control of her vehicle and went off the road. She struck a bicyclist, a tree and a house and died. The cyclist was hurt but not killed. So, Yes, a bicycle was involved in a fatal crash, but the cyclist was not killed. On July 11, 2010, a 7-year old cyclist entered the roadway in the path of a motorcycle. The motorcyclist, with a passenger on back, swerved to avoid the boy, struck the cyclist and lost control of the bike which led to the motorcycle crashing to the ground. The passenger riding on the back of the motorcycle was ejected, and killed. Again, a cyclist was involved in a fatal crash, but the cyclist was not killed. An error of 2 is not huge the grand scheme of Ohio’s crashes. In 2008, for example, there were more than 320,000 crashes – more than 77,000 injuries – and 1099 deaths on Ohio’s roads. So 2 isn’t a huge number… EXCEPT that two is a HUGE number when it’s 2 out of 11 cycling deaths! Steve is a Featured Blogger! Visit Steve’s New FACEBOOK Page! I think you are doing a great service. if we could get something cogent put together for all states, i’m sure we would have a much clearer picture of what’s going on. As you know or probably found out by now, the manner of fatal collisions is quite a bit different from the no or minor injury ones — i’m not quite sure how to address that. 1809 police reports per year (and around 4,000 per year in Arizona) is clearly infeasible without some sort of huge grant or something. Statistical sampling would probably be feasible. oh yeah, right on; there’s a lot room for error in the coding. oh; and a correction — i mis-spoke, above, there are about 2,000 bike-MV crashes per year in Arizona. That’s really interesting that you found a motorist fatality in a bike-MV crash. This will (should) be reflected in FARS which will come out around September. @Ed – Not a “motorist” fatality – a pedestrian – 83 yr old woman run over on a multi-use trail. Overall, i’m trying to point out that FARS is good for some things but not others. The 83-yo run over by a bicyclist on a trail should never never make it into FARS because it didn’t involve a MV at all, and didn’t occur on the road.